Comic book heroes don’t always have superpowers and come in all shapes, sizes, and genders. For every Superman, there is a Roy of the Rovers, for every Iron Man there is a Bill Savage character! During my childhood, I used to read whatever comics I could get my hands on once I learned to read (check out my post about dyslexia and how I learned to live with it) which often was British comic books such as The Dandy, The Beano, Topper, though I did get my hands on other comics such as Beezer, and the odd American comic book. For the most part characters in British comics tended to be very comical and played for laughs, but a few like Billy the Cat, a young boy who would use his skills as an acrobat to help the police catch criminals and solve crimes. It wasn’t until I was older though that I discovered comics like Commando and Battle and began to read stories set in World War II, or some other warzone. The artwork was more grown-up (even though a lot of artists had cut their teeth on comics for DC Thompson) and the stories gritty and dirty. One such story in the comic book Battle; was that of Johnny Redburn simply known as Johnny Red. He was a trainee pilot in the RAF who struck an instructor and was kicked out of the air force. He steals a Hurricane and flies off to Russia to continue the fight against the Axis forces, alongside Russian pilots of Falcon Squadron. I used to love the over the top action as a kid and always liked the idea of a rebel character socking it to the man. Now we are in 2019 and I am just about to turn fifty-six years old, a far cry from being ten! 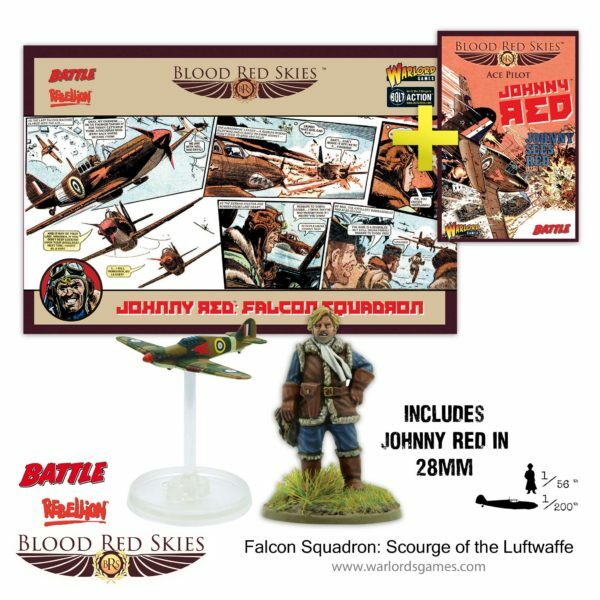 It has just been announced that Johnny and Falcon Squadron are about to be released in miniature format by the good folks over at Warlord Games for their excellent Blood Red Skies air combat game. The new expansion will not only see Johnny’s plane, but it will also include six other Hurricanes for his squadron mates, as well as a white metal version of Johnny himself that could easily be slotted into your Bolt Action forces. This expansion is in conjunction with Rebellion comics who now own the rights to the character and is bound to be well loved and received and is available for pre-order now!